EDGEWATER — The members-only Saddle and Cycle Club, a century-plus-old North Side institution, plans to expand its lakeside campus, officials said Tuesday. Inside its posh clubhouse on Foster Avenue, the club revealed plans to build a sports field and patio for its members on its newly purchased Sheridan Road lot. The nonprofit club — which collected $2.4 million in membership dues in 2011, according to tax filings — also requested community approval for a new 8-foot wooden fence to surround the field. City code requires a zoning variance for any fence taller than 6 feet. Though the club has been around since 1895, it is somewhat of a mystery to many Chicagoans. Its exclusive membership numbers about 500 families and its grounds have been appreciatively described as "ridiculous" with a small, manicured golf course, fantastic pool and an indoor skating rink. The club is rarely covered in the news, though a short news article, published on May 24, 1897, in the New York Times, announced the opening of Saddle and Cycle's new clubhouse, describing the organization as made up of "some of the best people in Chicago." It described opening day activities: "Golf-stockinged members chased a greased pig, which saved its bacon by running into the lake; rolled down hill in barrels, had potato races, and other games not usually played in society." The club now wants a fence with an "extra two feet of lattice on top," said Bill Ferguson, landscape architect with Daniel Weinbach & Partners, Ltd. which he called "a nice improvement." Ferguson said the fence would be set back 5 feet from the sidewalk. The area between would be filled with perennials, shrubs and evergreen ivy. Behind the fence, the club plans to build a sports field for its youth summer programs. The club also plans to build a patio and fire pit in the lot's southeast corner. Several sugar maple trees would also be planted just inside the fence, according to plans. The grassy land — previously owned by Dominick's Finer Foods, which had a store directly south at Sheridan Road and Foster Avenue — had been for sale for about five years and was bought from the grocer in October for $3.95 million, according to property records. 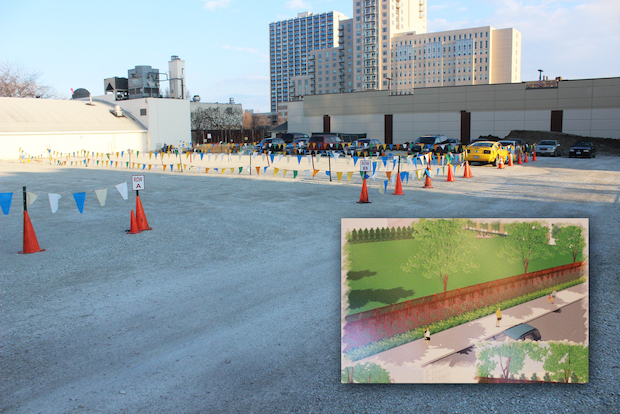 The club has used the lot recently for temporary parking as it renovates its permanent parking lot to the southeast. Ald. Harry Osterman (48th), who organized and attended the meeting Tuesday, said there had been other proposals to build multistory, mixed-use developments at the site within the last three years. "I just want to give that context as well, you know, as far as what could have gone here," he said. Sheli Lulkin, president of a condo-owner coalition along Sheridan Road in Edgewater, thanked the club for buying the land and preventing a possible sky-high development. The club's general manager, Guy Shaw, said at the meeting they considered buying an awkward, triangular-shaped lot between the future Mariano's grocery store and the club on Foster Avenue. But the price wasn't right. Shaw said the lot is listed at $1 million. The few residents who attended the meeting voted unanimously to support the zoning variance for the Sheridan Road fence. Michael Parrie, a resident of the Park Tower building about a block away from the club, said he supported the "simple" fence and sports field because "they're making it into a green space rather than a high-rise." Tax filings showed the club employed 113 people in 2011, collected $6.6 million in revenue and had $12.9 million in total assets at that time. The club's full-time, "key" employees include Shaw, who was paid $235,366 in salary and bonuses, and Richard Carlson, who was paid $118,704 in salary in 2011, according to the filings. R. Greg Neidballa, listed as "head tennis pro," was paid $268,124, and Scott Mansager, listed as "head paddle pro," was paid $190,339 in 2011. The club's 2011 board of directors was made up of attorneys, brokers and investors, including Elizabeth Sharp, John Freund, Allan Ryan, Douglas Fox, Barbara Sessions and others.